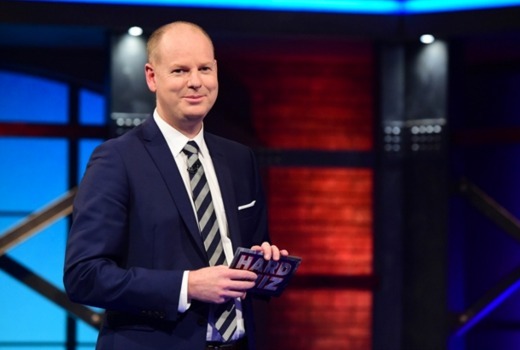 Landing his very own quiz show, The Weekly‘s Tom Gleeson takes his ‘Hard Chat’ persona one step further in this show that will finally fill the gap left by the absence of The Einstein Factor. The key difference here is that Gleeson cheerfully insults his 4 contestants, some of whom are quick enough to lob one back in return. There are four rounds in this game, which has been developed by the team behind The Weekly with Charlie Pickering (also the show’s producers). In the first episode contestants specialise in Flags, The Brat Pack, Field Marshals of the British Army and Doctor Who. The second round is Tom’s Speciality, a multiple choice on a random topic -this week its Burke and Wills. At the end of this round 1 of the 4 players is eliminated, amusingly staged as Gleeson invites them to publicly apologise for a dismal performance. Another player exits after the third round, the People’s Choice, which is effectively a ‘rapid fire’ of general knowledge leaving two players to battle it out in the final round: the Hard Quiz. This comprises a ‘best of 5’ between two remaining players with tougher questions on their specialist subject. Being the ABC, the eventual winner walks away with little more than a large brass mug trophy. A ‘Hard Off’ tie breaker (yes, really) will also come into play as required. It’s refreshing not only to have a quiz show without commercial breaks, but to bring a bit of comedy to the table. Gleeson’s deadpan persona is perhaps borrowing from Cornelia Francis’ Weakest Link ‘school-marm’ but with his tongue in his cheek. You can hear the audience chuckling along as all the ‘loveable losers’ in this vehicle careen towards the finish line, with the journey more important than the destination. I found myself wondering which insults were left on the cutting room floor, attempted in the studio but feeling awkwardly out of place in the cold light of post-production. In the spirit of the show, it’s all good fun. The gameplay is simple with just enough ‘playability’ for those competing from the couch. On its somewhat-deconstructed set, Hard Quiz is underdog telly which could easily be sold to other markets with the right casting. This really is quite good. Gleeson is quick and cheeky and the guests are up for it. It’s good to see him handing it out of the cuff… some very funny moments. I’ve watched them on iview at odd times but I reckon it could be best at the appointed time after dinner – with a wine or beer in me :-). I hope it gets another run. Much better second episode thanks largely to the contestants this week. The Richard Gasquet enthusiast Renae was a real hoot giving as good as she got and came up with some hilarious come backs to Tom. I agree after watching the “encore”. I laughed even more in this second episode. The main thing I like is that you can end up with a three-person comedy team improvising off each other, if the contestants are up for it. I really enjoyed it, although I felt the “insults” to the contestants were a little too focussed on a single contestant. Probably because the Dr Who stereotype is so easy to lampoon. Looking forward to the next episode. Maybe it’s because I never liked the Hard Chat concept but I was really disappointed in this although loved the quiz setup. Could Tom seriously not think of anything funnier than a bunch of Dr Who fan cliches so old, they’re on the pension? A couple, sure, but a whole half hour of it is just lazy. Agree, it came across as a little mean and unnecessary too. There is a fine line between witty snark and lazy, cliched insults. Hopefully it will get into a groove in the upcoming episodes. As a Doctor Who fan, the stereotype would be for me to be upset or offended but you know what I wasn’t at all. I miss The Einstein Factor. I will very much enjoy this show. I like watching The Weakest Link clips on YouTube because Anne Robinson is very honest. Doesn’t mince her words. She is like the Simon Cowell of quiz mastering. If Tom Gleeson is really like Anne Robinson, I will make my family watch it as well because I feel they will enjoy it as well as me. I do not find him remotely funny. He & Kitty Flanagan are the reason why I had to turn off Weekly with Charlie Pickering every time they appeared.